Born and raised in Belize, Kareem graduated secondary school and was in college when he started hanging out with the wrong crowd. During that time of learning subcontracting work, Kareem and his brother met a missionary group that was building a settlement in Belize and he and his brother were hired by the group to build houses for their community. Kareem and his brother were well liked by the missionary group and, in 2000, the missionary sponsored Kareem and his brother to come to the United States to help build another community in Indiana. In Indiana, Kareem and his brother experienced racism for the first time. Being foreigners and minorities working in rural Indiana, they were not accepted by the residents and were treated harshly. Soon after, Kareem and his brother left Indiana. His brother got engaged and moved back to Belize and Kareem stayed on, moving to New York City. In New York, Kareem finally felt comfortable living in the United States. “It was joyful” Kareem said, “I finally got to meet my people.” A large Belizean population in New York made it easier for Kareem to settle and establish roots. Kareem spent the first seven years in New York living in Manhattan with his aunt and working odd jobs. He did such good work that he was recommended by his cousin to become the Super of his aunt’s building. Soon after, Kareem got his own apartment and was doing well with a good job, an apartment, and a new born baby girl. Kareem started working at junkyards doing bodywork to make ends meet. He bought a car and lived in his car commuting to and from different junkyards for work. While living in his car he was engaged by Breaking Ground in Queens. Kareem was engaged multiple times by their outreach team. He was open to being helped and was taken to Urban Pathways’ Hegeman Safe Haven in Brooklyn. There Kareem learned about Urban Pathways and the UPwards Career Enhancement Program that would help him with finding a job. Kareem signed up for the 12-week program that provides a comprehensive range of vocational rehabilitation services including career counselling, job training, internships, and referrals to educational programs. Participants have weekly classes they must attend that are taught by Career Development Specialists. These specialists assist the clients on both a one-on-one basis and in a group. Before his UPwards Program was completed, Kareem had secured a maintenance job in Brooklyn. He has been on the job for nine months and he loves it. Kareem continues to keep in touch with his family back home in Belize. His father passed away four years ago and that continues to be hard for him, as he credits his father for teaching him everything he knows. Kareem is confident he will be moving into permanent housing soon and with his new job he is happy, confident, and thankful. Music Kitchen Performs 100th Concert at Olivieri Drop-In Center! 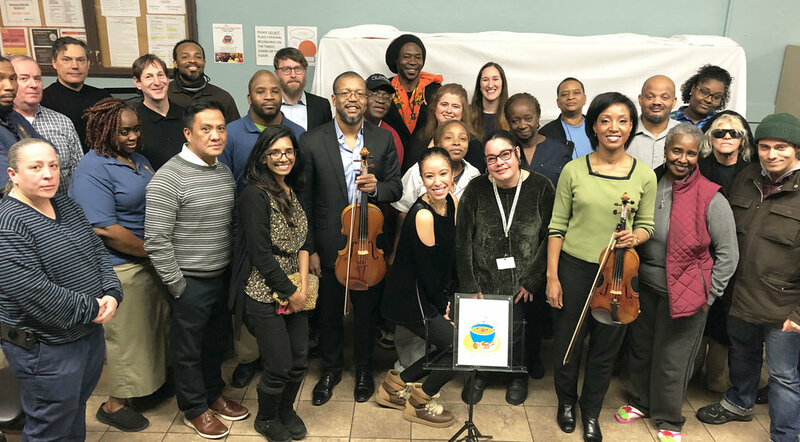 Last month, Kelly Hall-Tompkins, Violinist and founder of Music Kitchen, hosted Music Kitchen’s 100th concert for clients and staff at our Antonio Olivieri Drop-In Center. Music-Kitchen started 14 years ago, is a community service-oriented organization with a mission to bring top emerging and professional musicians together to share, inspire, and uplift New York’s at-risk and homeless population. The 100th concert featured the Dvorak Bass Quintet and “For My Father” composed by Jeff Scott, Performed by Kelly Hall-Tompkins and Ben Russel, violins; Orlando Wells, viola; Peter Seidenberg, cello; Stephen Sas, bass; Allison Charney, soprano. With coverage provided by NBC’s Harry Smith to be aired on Sunday Today in New York on February 17th. Over 30 clients and staff joined in the 90-minute concert where Kelly introduced the music, its origins, the composer, and the instruments being played. Kelly also explained the Song Cycle Commissioning Project entitled “Forgotten Voices” which will commission 15 of the top composers of our time to create works based on the reflections and insights shared by clients in the audience. Clients enjoyed listening to classical music and engaging with the artists and Harry Smith of NBC after the concert. Lastly, clients and staff were treated to a cake celebrating the 100th performance. We look forward to having Music Kitchen back at the Olivieri Drop-In Center again, later this month, for another concert for our clients! Sophia Mullens, Wellness Coordinator at Urban Pathways’ Ivan Shaprio House. Urban Pathways’ Communications Staff recently sat down with one of the amazing employees from one our supportive housing residences. Sophia Mullens has worked for Urban Pathways for two and a half years, beginning as a Case Manager and now as Wellness Coordinator. Sophia grew up on Long Island and in college majored in psychology and childhood adolescent mental health, Sophia also has a master’s degree in Psychology. 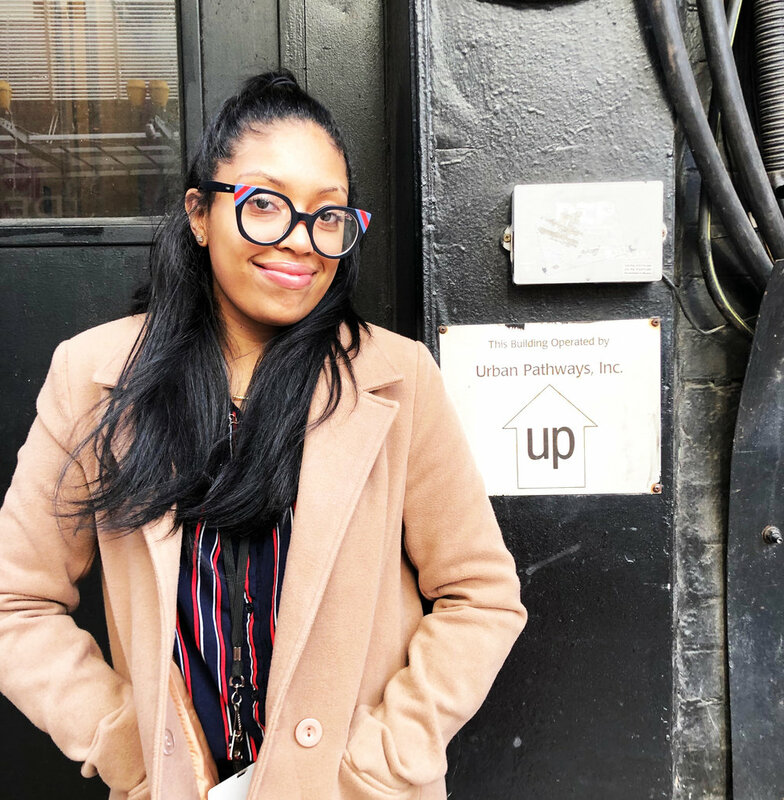 Read below on why Sophia chose psychology, how she engages Urban Pathways’ clients in wellness and self-management and how rewarding it is to see someone become stable and self-sufficient. Why did you choose a psychology as a major? I chose psychology because I was always interested in how the brain works. In college, I saw firsthand Art Therapy in action and how it reengaged participants with their community. Who resides at Ivan Shapiro House? Ivan Shapiro was built in 1997 and is the oldest building Urban Pathways owns. It is home to 55 men and women, all of whom have been chronically homeless and have a history of mental illness. What are some of your responsibilities at Urban Pathways? Some of my main responsibilities are running the wellness groups, coordinating housing interviews and putting together housing packages for clients who are ready to move out, making sure the clients get their annual physicals, filling vacancies, and coordinating events and programs. How do you help clients with wellness and self-management? I assist clients in their wellness and self-management by having an open-door policy, I want clients to feel comfortable coming to me when they have a problem and working with me on specific goals to achieve stability in their wellness and taking an active role in their health care. Wellness Self-Management Group Participants receive their certificates of completion. I meet with clients as a group on a daily basis or a couple of times a week depending on the group. Also, I meet clients one on one in my office throughout the day. Can you describe your group meetings? Some of the topics covered in group meetings are: managing personal budgets, apartment cleanliness, healthy eating and other basic needs. Programs typically run 60 – 90 minutes and client events can last a couple of hours. Outside organizations come in and present to our groups on topics related to wellness and self-management. Clients graduate from wellness groups and later come back to give inspirational speeches to newer groups. Also, we have dedicated volunteers from our Associate Board and organizations like The Legal Aid Society that hold monthly events for the residents. How do these programs benefit clients? These programs help clients by providing educational opportunities and reinforcing positive interpersonal skills. This renews a sense of self-esteem in clients and helps them realize their potential. How does staff collaborate to assist clients in their wellness? Staff facilitate communication between each other and the client, with the hope of all parties being on the same page regarding reaching goals in a client’s wellness and self-management. At Ivan Shapiro, we are lucky to have a full-time nurse, an employment specialist, and a consulting psychiatrist in addition to the case managers, operations staff and myself. This multidisciplinary team provides a well-rounded approach where everyone working in tandem based on the client’s needs, and the client is receiving the staff’s full support. How does it make you feel helping clients in their wellness and recovery? Personally, it makes me feel great to see people improving their health and wellness. It’s all about the client and how determined they are in recovering. We the staff, give the clients the tools, they are the ones that make the change. Helping clients also gives me a structure to my life as well, so it comes full circle because they are helping me too. What’s new at Ivan Shapiro House in 2019? New this year we are hosting a Social Justice Inequality group that was created to get clients more involved and aware of social justice issues. Also, we have a blanket drive coming up for our clients. Sophia with clients at the Homeless Memorial Service last year. Describe a need that you have at Ivan Shapiro? Here at Ivan Shapiro House we need funds for activities for our clients. We would love to give clients the opportunity to attend events in the community. Encouraging clients to be active members of the community is an important goal of our housing programs at Urban Pathways.